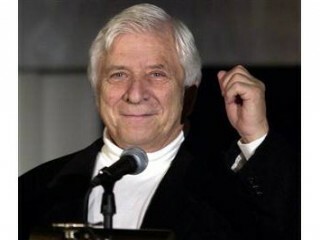 Birthplace : Ojai, California, U.S.
Elmer Bernstein was an American composer and conductor best known for his many film scores. In a career which spanned fifty years, he composed music for hundreds of film and television productions. His most popular works include the scores to The Magnificent Seven, The Ten Commandments, The Great Escape, To Kill a Mockingbird, and Ghostbusters. Bernstein's childhood was filled with creativity. Born to Ukrainian parents who were both creatively inclined (his father taught English literature and his mother was a dancer), young Bernstein took dancing lessons and played the piano. He also won prizes for some of his paintings. At age 12, he forsook his other talents, and focused on playing the piano. He won a scholarship to study with Henriette Mitchellson, who also taught at Juilliard. She recognized his talent for improvisation, and arranged for Bernstein to meet with Aaron Copland. Copland also saw the talent of the child prodigy. He arranged for Bernstein to study under Israel Citkowitz. Bernstein also attended The Walton School, and later went on to New York University. Bernstein graduated from New York University in 1942. He joined the army, and began writing scores for propaganda films. His work for United Nations Radio was brought to the attention of a Columbia Pictures executive. The executive offered Bernstein work on two films: Sunday's Hero, and Boots Malone . His work on the movies led to another film, Sudden Fear, starring Joan Crawford and Jack Palance. The unusual score brought Bernstein to the attention of many in Hollywood. In the late 1940s and early 1950s, Senator Joseph McCarthy of Wisconsin began hearings trying to locate and squash members of the American Communist Party. Many of those in the entertainment field who did have Communist leanings were black-listed; in other words, they were barred from getting any work. Bernstein's career as a film composer was almost derailed due to a brief stint working on a left-wing newspaper. Though he was not black-listed, he was "gray-listed," which basically meant he could get work but nothing major from the studios. His time on the gray-list was short. Director Cecil B. DeMille hired him to score just the dance scenes for the epic The Ten Commandments ; however, the lead composer grew ill, and DeMille offered the entire film score to Bernstein. Bernstein was offered the chance to score The Man with the Golden Arm, starring Frank Sinatra. While previous films had used jazz before, no one had ever written an all-jazz score. This new work took film music in a new direction, and Bernstein was praised for this effort. According to elmerbernstein.com, Jack Moffitt told the Hollywood Reporter, "Elmer Bernstein's historic contribution to the development of screen music should be emphasized. Until now jazz has been used as a specialty or a culmination of a plot point. It remained for Bernstein to prove that it can be used as a sustained and continuous story-telling element in underscoring the mood elements of an entire picture." Bernstein soon became a much sought-after composer. He created jazz scores for a number of films including The Sweet Smell of Success, and Academy Award-nominated Walk on the Wild Side . However, Bernstein would not be pigeon-holed into one genre. Bernstein was also offered the opportunity to score To Kill A Mockingbird. He had a little difficulty with writing the score, but soon decided to include a child-like quality to the music, since the film was about seeing adult problems through the eyes of a child. The score was nominated for an Academy Award, and won a Golden Globe. It was also one of Bernstein's favorites. In the 1960s and early 1970s, Bernstein scored several Westerns, including a few that starred John Wayne. Also during this time, he won his first and only Oscar for the film score to Thoroughly Modern Millie. Many felt this was one of his less distinguished works. In the late 1970s, Bernstein began scoring comedies. He wrote the music for National Lampoon's Animal House, Airplane!, and Stripes, all blockbusters. In the early 1980s, he also wrote the scores for Ghostbusters and Trading Places, among many other comedies. He received another Academy Award nomination for Trading Places. Moving to another genre in the film industry also proved profitable for Bernstein. He scored the music for the independent film My Left Foot. He also began collaborating with famed director Martin Scorsese, starting with the film The Grifters. Bernstein had long admired the work of composer Bernard Herrmann, and when he learned that Scorsese was remaking the film Cape Fear, he asked for the chance to rework Herrmann's original score. Scorsese agreed, and both were able to present a work that was remarkably different from the original motion picture. Throughout his career, Bernstein worked with a number of Hollywood's top directors, including Francis Ford Coppola, Jim Sheridan, Martha Coolidge, Al Pacino, Carl Franklin, and Todd Haynes, who directed Bernstein's fourteenth Academy Award-nominated film, 2002's Far From Heaven . Though prolific in the 1950s through the 1980s, work came in less and less as movie studios switched from using orchestral scores to using music that would also generate album sales. Nonetheless, Bernstein also recorded a large portion of his music on record as well as the music of other great film and television composers. Many used his music as well, particularly his theme from The Magnificent Seven, which was used in cigarette ads for Marlboro. In addition to his composing, Bernstein was also an instructor at the University of Southern California's Thornton School of Music. He was vice president of the Academy of Motion Picture Arts and Sciences and president of the Composers and Lyricists Guild of America. He was also president of the Young Musicians Foundation, and a founding life member of the National Academy of Recording Arts and Sciences. He was president of the Film Music Museum, and on the board of directors at ASCAP. In addition to being nominated 14 times for an Oscar, and winning one time, Bernstein also was nominated twice for an Emmy, winning once for his score for the television program The Making Of The President. He also received three nominations for Golden Globes, winning two for the films To Kill A Mockingbird and Hawaii . He received two Tony Award nominations, and won a Downbeat award for short film Toccata For Toy Trains . He also received two Western Heritage Awards for the scores for The Hallelujah Trail and The Magnificent Seven . Bernstein also received five Grammy nominations for various compositions, scores, and themes for 1993's The Age of Innocence, 1984's Ghostbusters, and 1962's Walk on the Wild Side. He married Pearl Glusman in 1946; they divorced in 1965. Bernstein died on August 18, 2004, in Ojai, California; he was 82. He is survived by his second wife, Eve, their two daughters, and two sons from his first marriage. View the full website biography of Elmer Bernstein.